“Pintxos” are little bites of food made with varying degrees of sophistication. “Going for pintxos” is part of the lifestyle in Pamplona, always accompanied with a local wine from Navarra. Below you’ll find the top 10 Pintxo Bars in Pamplona with recipes for the best pintxo from each restaurant/bar, many having earned the award “Best Pintxo of the Year”. A mandatory stop on the Way of St. James and a historically unavoidable place of passage for all those heading towards the border, not to mention centuries as capital of the no longer existing yet ubiquitous Kingdom of Navarre, Pamplona (Iruña in Basque) has since time immemorial received myriad gastronomic influences from the travelers who have crossed through the area or even chosen to stop and live here. If we add to this the fact that the region rubs shoulders to the south with some of the richest vegetable producing regions in Europe and with the influence of San Sebastián and France to the north, we find ourselves with a hugely exciting city for lovers of fine dining. It was only a question of time before “miniature cuisine” took hold of a city which, though maintaining its fondness for quantity, takes increasingly greater care with the quality and variety of its cuisine. Pamplona has become an ideal destination for foodies and pintxo-lovers, and this book is a perfect guide for all those who wish to check it out for themselves. 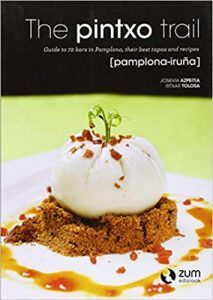 This book, The Pintxo Trail Pampona (Iruña), written by Josema Azpeitia and Ritxar Tolosa, is a guide to 72 bars in Pamplona with their best tapas and recipes.